My good friend Craig Waters (@cswaters) recently asked me about my audio gear on Twitter, and suggested I write it up. Hopefully this will help others who, like me, are relative newbies to audio and so don’t understand all the highly technical lingo. The centre of my audio recording setup is a Zoom H6. It is a wonderful piece of kit. Utter overkill for the amateur, but I’m terribly pleased I invested in it when it was on special. I picked it up from sounddevices.com.au for under $500. The two microphones it comes with are an X-Y, for left-and-right channel sound when you point it straight at something, and a mid-side microphone, which can record left and right sound as well as the ambient noise around you. With the mid-side microphone, you can use audio processing software to remix the left and right channel balance as well as the amount of “ambience” around the main audio. The H6 also has 4 other inputs for XLR and 1/4″ style plugs that are the standard for most audio gear. Microphones tend to have XLR plugs, and guitars and keyboards tend to have 1/4″ stereo plugs. There is an incredible amount to know about microphones if you want to dig into it, and I know almost none of it. But I’ve learned a couple of handy tips in the past few months. There are 2 major types of microphone: dynamic ones, that are cheap to make and have decent dynamic range for voices. These are the ones you’ll find at your neighbourhood music shop, and they can take a real beating. “Dropping the mic” is unlikely to break them. The second kind are called condenser mics, and they’re what go into the high-end pro microphones that cost hundreds (or thousands!) of dollars. Condenser mics require power to work, and the Zoom H6 can supply that power, called “phantom power”, and at multiple voltages: 48V, 24V and 12V. The standard is 48V. Only the four external outputs can get phantom power, not the modular microphones that plug in to the top. I bought a halfway decent dynamic mic from my local music shop, and it has worked just fine with the H6 and doesn’t require phantom power. There’s also a thing called “plug in power” which is what smartphones and iPads and the like do for their microphones to work. They run off much lower voltages under 10V usually, and won’t work without this power. Once you turn that on, the mics work just fine. These lavalier mics are monophonic, not stereophonic, so they only put sound on one channel. It goes on the left channel, because of the way the plugs are designed: the shaft is the ground, left signal is the ‘tip’, while right channel is the ‘ring’ on a stereo plug. Mono plugs don’t have the ‘ring’, so the right channel is connected to ground. 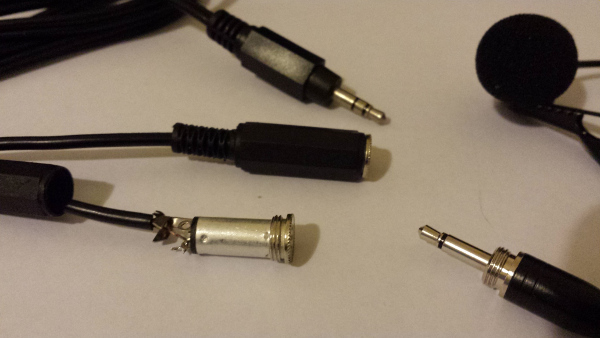 Because I thought my mics were having problems due to the mono plug (because I didn’t really know anything before doing this investigation) I went and bought some mono plugs from a local electronics hobbyist store so I could wire up a mono to stereo adapter cable. As a bonus, I figured I could send the mono signal from one microphone to the left channel, and send the other mic to the right channel. Then I could record from two lav mics at once, into a single stereo channel. I used an old stereo to RCA cable (the kind you used to use for component audio on VCRs. Remember those?) and just chopped off the RCA ends. The wires on this cable have ground on the outside and signal on the inside, so I just stripped back the ends and soldered it to the mono plugs. Once I’d turned on plug in power, this cable let me run both lav mics at once, with one recording on the left channel, and one on the right, using the LR channel on the H6. As an added bonus, this cable means I can use these mics on anything that accepts a stereo 3.5mm plugin power microphone input, including computers, and I already have 3.5mm to 1/4″ plug converters. The one downside to this approach is that I can’t use the mid-side or X-Y mics at the same time as using the lav mics, because I have to use the plugin power socket on the X-Y mic to make them work. Still, if I need ambient background, I can use my dynamic mic to record it and muck around with software to change the way things sound. My audio software of choice is Audacity, but more on that another time. Tagged audio, media, microphone, podcast, recording.